WOW!!! What can I say this book is amazing. It is set about 200 years after the world destroyed itself. The survivors are living either as settlers in the ruins of the cities or as wilders in the open countryside. The book is centered on Lynn a wilder and Dani a settler. They set out on a journey to recover the body of the leader of Dani’s group. Predators roam freely and there is possible danger at every turn. Everything is a struggle. But they persevere and bond. They learn to trust each other and that turns to love. But the return journey turns into life and death. The settlers don’t trust Lynn. But when Dani gives her version of events they also learn to accept Lynn and trust eventually comes. Lynn constantly questions herself if life alone is better than with people to care about. Dani teaches Lynn to love. Lynn stays for Dani but finds she actually likes having people to care for and have them care in return. I have never read this author before but I will look out for her in the future. I liked Dani immedisately but she made me fall in love with Lynn. This book would make an excellent post apocalyptic movie. Enjoy!! 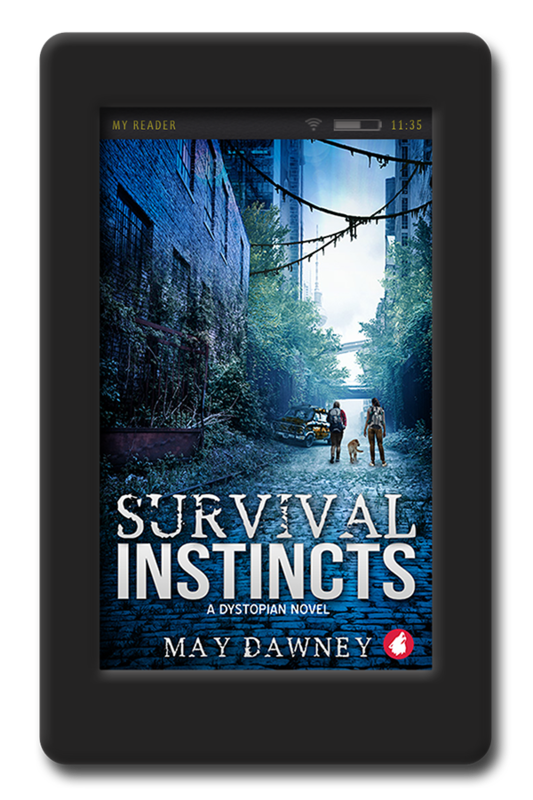 Survival Instincts is the kind of book that grabs your attention early and holds onto it much too late into the night. Once I started it I found it very difficult to put the book down again. But it’s a big novel and you will be forced to wrench yourself out from time to time unless you have an entire day (or more depending on the reader) at your disposal. I loved the action and the character progression. Dawney did an excellent job showing us what our world would look like a few hundred years after being ravaged by war. With histories forgotten and people forced into nomadic and hunter/gatherer roles, it is a true sampling of what people would be reduced to without the modern things we rely on. Lacking the modern medicine, community, and tools we take for granted every day, the world becomes a treacherous place. Your life is in danger every minute, be it from a pack of wolves, or a simple cut from a rusted out car. I rooted for our protagonists through it all as they journeyed through the massive landscape of New York City. It was a suicide mission but they were determined not to let it kill them. And while they started as enemies, that too changed as they grew to trust one another. I was given this ARC in exchange for a fair and honest review. This is a very good dystopian novel. I’ve read many novels that lean toward dystopian, and many of those are crap. Thankfully, this one does not fit into that mold. The characters are well drawn, the story flows smoothly and captures you with the very first page…and it keeps you captive until the very end. The author did a fairly good job of describing what the world would be like with the human population decimated 200 years in the future. The only unrealistic part of the story for me, was the fact that a good portion of New York would be a little more in ruins because of the flooding that would occur both underground and above ground once the pumps quit for good. Most of New York hundreds of years ago was swampland, and would return to that without those pumps running constantly, which would affect many of the tall skyscrapers and cause them to start falling eventually. Other then that, the author described a post apocalyptic world much as I imagine it would be. If you enjoy dystopian novels, this one would be well worth your time. 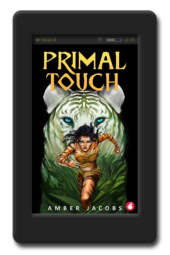 I thought this was a great book, very engaging, great characters, lots of heart-pounding action! Very clean from an editorial standpoint. I’d enjoy a sequel, (but I’m not holding my breath for one since the author has her book release schedule already set, and there’s no sequel on it). The only thing that pulled me out of the story was after so many years after a war, and the resulting diminished population, Central Park, and most of New York, would be a lake without the pumps running that keep the city dry. There are dozens of pumps under the city right now, and they and the humans that maintain them, are the only thing keeping the subway tunnels from flooding. Other than that, I thought it was a very readable and enjoyable book! 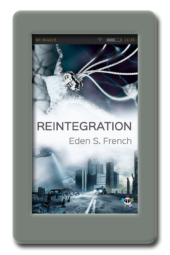 The balance of writing a dystopian novel with a romantic twist is a precarious and daunting project. Not only did the author manage to master that feat, but she also managed to draw the wilds of a dystopian America of the future as a major character of the story itself. Fortunately, we are not bogged down with insignificant details about how America came to its present in the book that would inevitably draw our attention away from Lynn and Dani. Instead, the wilds of war-ravaged America chased them constantly like a deranged Freddy Krueger chasing unsuspecting teens in a horror movie. It’s this fear of death by predator, starvation, accident, or weather that keeps you on the edge of your seat as the two women journey together. Observing their forced march and raw survival blossom from a tentative alliance to an impenetrable love coupled with non-stop action made for an entertaining and swoon-worthy story. I was unconcerned with the spectrum of believability regarding details of how the world would work in a war-torn futuristic America. I was too swept up in Lynn and Dani’s desperate survival and burgeoning friendship and romance to ponder why, for example, zebras roamed in herds on Manhattan island. It’s fiction, so I roll with it and immerse myself in the mind of crafty story-teller. I enjoyed her writing style and appreciated the crisp editing. I am eagerly looking forward to more offerings from this author. what a great book, just to have the imagination how the world would look like after a complete destruction. Nature claims back its place including animals. The few survivors in this world are Wilders or Settlers, with the only purpose to stay safe and live. When Lynn, a Wilder for many years, meets the people of Homestead, they don‘t trust Lynn and even accuse her of killing one of their own. With Dani, a Settler from Homestead, she‘s on a mission to prove she‘s right and bring home the body of the dead Homesteader. The slow building trust between Dani and Lynn, their journey and adventures are fascinating and it keeps you reading on and on. I want to start saying this is a great book and one I definitely would love to read again, despite of addressing one of my biggest concerns about humanity, it is very well written, the story is flawless and a bit scary if we consider this could actually happen, but ironically that’s what makes this book a great read, it’s so detailed that you can basically feel being there, the fear, the despair, the adrenaline flowing freely and high, but also the brewing, growing romance between Lynn Tanner and Dani Wilson. They live in a very different world known by us in the present, it’s a post war world and civilization has ended, wild life has replaced the so called ”concrete jungle” once dominant, turning into a real one, but even when animals and nature have overtaken everything, humans keep being the biggest threat for those wandering alone and undoubtedly for a woman alone. Written in third person focused on Lynn and it is perfectly done. I like the flow of the story, it’s never dull, always in motion, full of action and keep you all the way on the edge of your seat, not wanting to stop to know what is about to come. 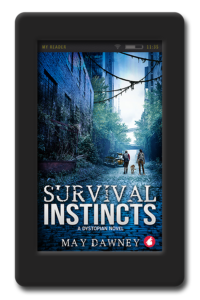 Starts when Lynn has to go to New York, finding herself trapped in an impossible situation with a group of people and has no choice but to fulfil a hard task, but she is sent with a guard…Dani. Lynn is used to be alone and free, going through everything needed to keep her safety, to say things take an interesting, intense turn going to the task at hand while Dany is guarding her and the trust is inexistent…. it’s an understatement, things get more intense when she starts to develop feelings for Dani and questions all she has believed for so long, wonders if being alone is indeed the best way to survive. It isn’t an easy road for them but at the end it’s a very satisfactory one and despite of the always present dangers, they find their way together and a glimpse of happiness that comes with falling in love. It’s a must read undeniably, great story, well written, excellent characters, characters growing, action, emotion, intensity, passion, it has so much to offer, leaving that great feeling you get after a grand story. I highly recommend it. It’s hard to leave it once you start.